Image of a red-tagged building in Napa, Monday, Aug. 25, 2014. 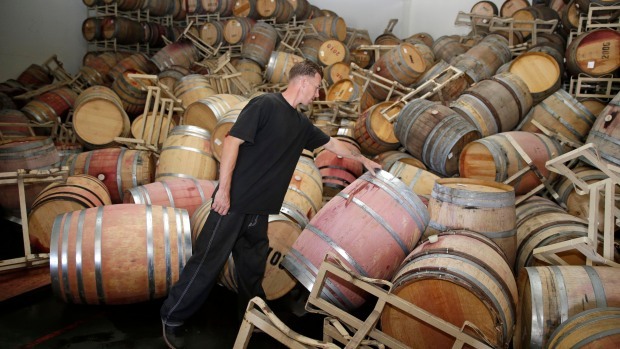 Following Sunday's 6.0-magnitude earthquake that struck the heart of the nation's wine country - and sent several of those wine bottles crashing to the ground - city planners have created an interactive, online map to show which buildings were the most damaged. As of Tuesday, the Napa Earthquake Damage Map showed the highest concentration of buildings on Brown Street, such as the old courthouse, and nearby Main Street. As of Tuesday afternoon, Napa city leaders 103 buildings were on the red-tag list, and 500 buildings on the yellow-tag list. More than damaged buildings, however, the map showed a plethora of water leaks all over the city. As of Tuesday, the public works department reported a total of 107 water mains that had broken throughout Napa.